In the 2016 MozCon, Rand Fishkin’s presentation on SEO showed that Twitter was the #2 social search engine. Twitter’s Advanced Search has powerful search operators; using these can sometimes lead to results that are better than using Google. Twitter contains a wealth of information that can be searched by just about anyone. Popular with journalists and academics, Twitter is often where breaking news is released. High volume and high velocity tweets make Twitter the perfect playground for data scientists looking to power up their natural language processing artificial intelligence. When normal people (when I say normal, I mean people like you and me, who are not developers and cannot write code) want to perform a search on Twitter, most will use the search bar on the top right corner of most pages on Twitter.com. 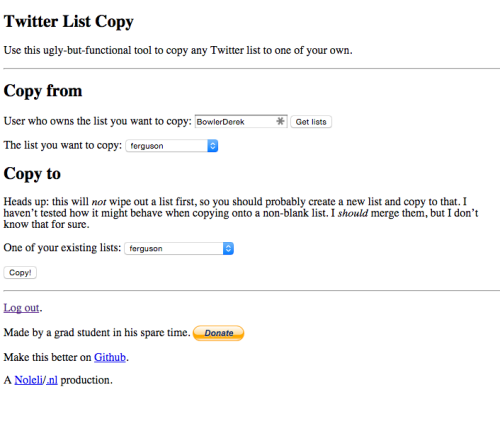 This lets you perform a basic search on Twitter. You can access the search page directly via https://twitter.com/search-home. 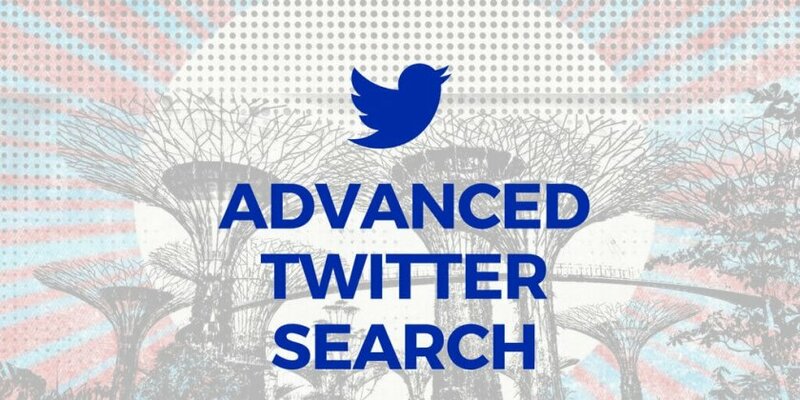 More sophisticated users of Twitter will know that you can do an advanced search on Twitter by going to Twitter’s Advanced Search page or using Twitter’s Search Operators. If you can’t remember these operators, then remember this power tip: if you hit ? on any page on Twitter, the shortcut key will launch the menu of search operators. #Power #tip: Hit ? on any page to launch Twitter search operators. Note that you can only use the location-based search (e.g. near: “Singapore”) if you enable your location. However, I suggest disabling this feature and deleting your location information after using it because anyone who wants it can access it via Twitter’s API. Another thing to be aware of is that the Positive 🙂 Negative:( and Question? search operators are misleading. They imply that you can search for Tweets using some form of sentiment analysis. That is not true. It will only pull out tweets that use the emoji or emoticons. Unfortunately, Twitter has yet to integrated Sentiment Analysis in its Search feature. If you go to the Developer’s page and you’ll find a longer list of search operators. The filter and url:site.com are other operators listed in the Developer list. 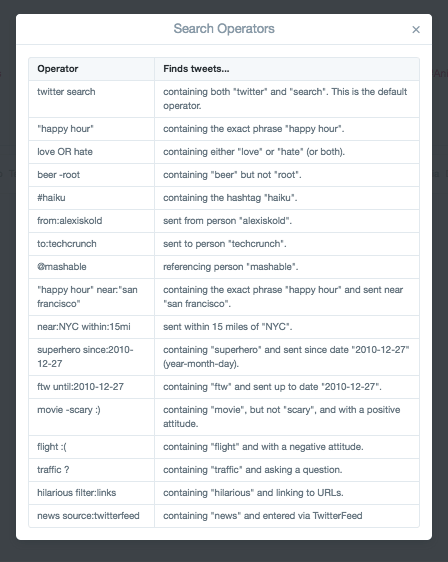 In particular, the list:USERNAME/list-name search operator allows you to pull all the tweets of the people listed. For example, search “list:debbiediscovers/twitter-all-stars” and it will pull up all the tweets from Social Quant’s “21 All Star Twitter Accounts to Follow” by Twitter guru Aaron Lee (@askaaronlee). 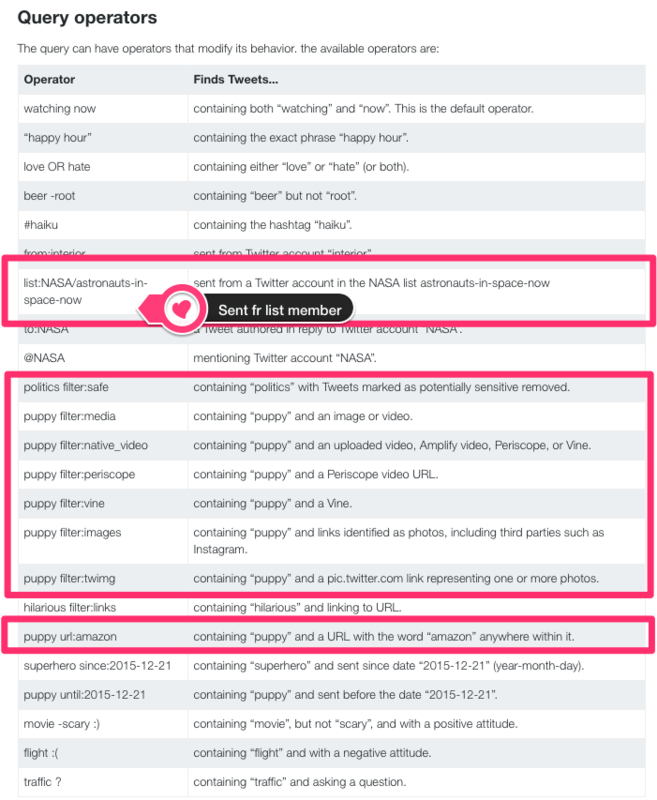 Amit Agarwal from Digital Inspiration‘s blog lists two operators: min_retweets:5 AND min_faves:5 are filters that work well to identify popular posts and to filter out much of the “babble” that one tends to find on Twitter. Remember to use ALL CAPS when using boolean search operators AND, OR, NOT or the – sign to combine search terms. Search tweets from people in a Twitter list. Popular with journalists who are covering a certain topic / person. Using Google to search Twitter lists has proved surprisingly useful. Search Google for site:twitter.com/*/lists/[KEYWORD] will show you all the Twitter lists. 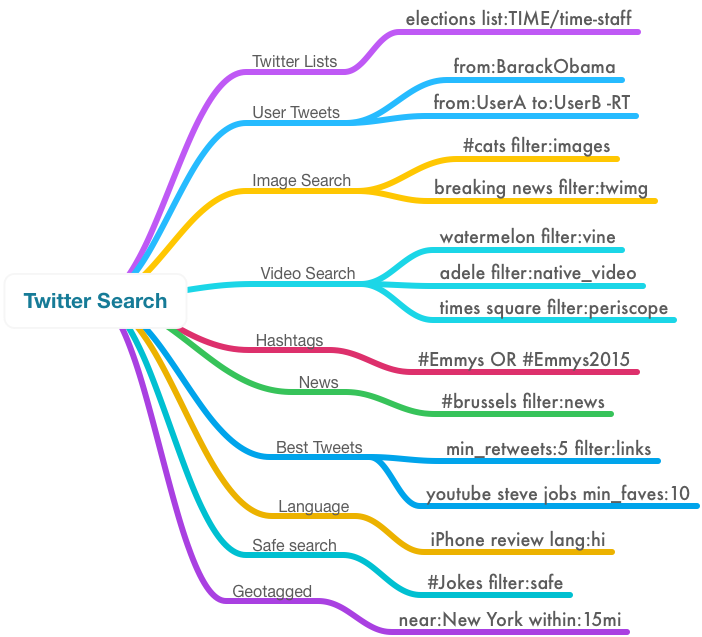 (Another way is to use ElectoralHQ’s Twitter list search – however this does give you lists that can be quite old).